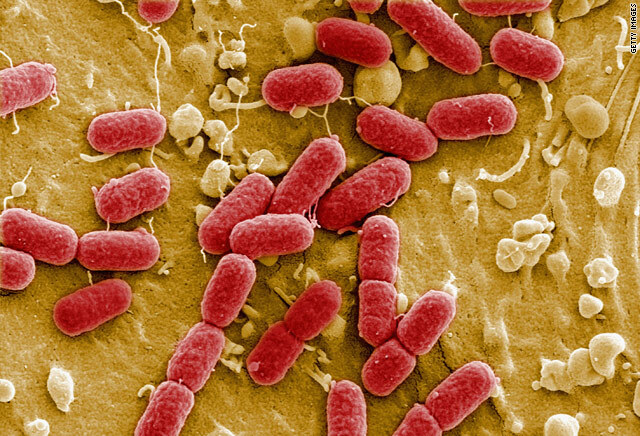 Berlin (CNN) -- Four more deaths have been confirmed by German health officials Friday bringing the total number of European deaths from an E. coli outbreak to 31. All but one were in Germany. According to German health authorities the bacteria has been traced to sprouts found in a North Rhine-Westphalia household in western Germany. This is the first time the actual bacteria has been found in produce. The number of people infected with E. coli now stands at 2,988, of whom 759 have the severe form of the intestinal illness. Though the rate of infection is slowing, officials at the Robert Koch Institute said the number of infections will continue to rise. A spokesman for the German ministry of consumer affairs said sprouts were tested in the home when two members of the family became infected after eating the sprouts. The vegetables in question seem to originate from a farm in Northern Germany that has already been linked to the outbreak, ministry spokesman Stephan Melessa. Investigators determined bean sprouts were the cause of the outbreak after 17 people became ill after eating at the same restaurant, Reinhard Burger, president of the Robert Koch Institute, told reporters. Authorities questioned people about what they ate and asked the cooks where the ingredients came from, Burger said. The common denominator, he said, was only those who ate food containing the sprouts became ill. Farmers in Spain, France, Holland and Belgium have been seeking compensation for their losses. The European Commission has proposed that the European Union pay about $300 million, but Spain alone claims about $600 million in losses. In Spain, the fresh produce exporter Frunet filed what is believed to be the first lawsuit by a Spanish company against the Hamburg state government over its earlier allegations that Spanish products were to blame for the E.coli outbreak. The complaint, filed Thursday in Hamburg, demands the immediate release of all laboratory tests and other documentation that Hamburg officials used when they blamed -- wrongly it turns out -- Frunet's organic cucumbers as a source of the outbreak, Frunet's owner, Antonio Lavao, told CNN by phone on Friday. Frunet, based in Spain's southern Malaga province, expects to file another lawsuit against the Hamburg state government seeking 1 million euros ($144 million) in losses from fresh produce it had to destroy, Lavao said. "My company was named specifically" by German authorities, Lavao said. His exports remain blocked because even as German and European Commission officials have cleared Spanish cucumbers generally of any link to the outbreak, there remains suspicion among his clients since his firm was identified, wrongly, as a source of the bacteria, he said. "We don't want to be collateral damage. We want a specific rectification," Lavao said. The lawsuit is the first of its kind by a Spanish company against German authorities, said Jose Maria Pozancos, managing director of Spain's fresh produce export federation Fepex. Frunet grows relatively few cucumbers; its speciality is premium tomatoes for export. Lavao said he was not confident that his firm would receive any public compensation, which is why it filed the lawsuit against German authorities. CNN's Frederik Pleitgen and Al Goodman contributed to this report.